Even at the best hotels, food is almost never as good as home cooked… I’m not a breakfast man during the week (needs to change) but when it’s the weekend, I enjoy nothing more. A simple thing like eggs for breakfast is rarely simple during travel. I’ve been fortunate enough to stay at the best hotels almost around the world (I’ve had my fair share of dodgy places too) – but that’s no guarantee. 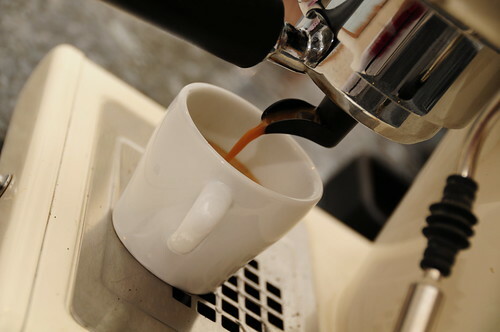 The perfect mix of good toasted bread, properly prepared quality eggs and, of course, a proper coffee – is almost impossible to find. I returned last night. It’s the weekend. 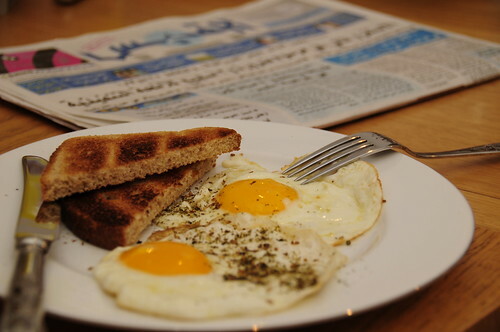 My wife prepares the perfect eggs, I catch up with Kuwait’s news, and I use my real machine not the office Nespresso. It’s a great start to the weekend and I wish you all the same. Scrambled eggs does it for me! Noor was not well, so I went alone. Will post some shots later. The picture of the eggs…sprinkled with pepper..jus made me hungry….though, like you, I too aint a break-fast man. Btw, get well soon wishes…to lil Noor. She’s sleeping next to me now 🙂 spent the night at hospital but better now thank God. Ugh. I am supposed to be eating oatmeal. And bran. I doctor it up with brown sugar and blueberries or raspberries so I can eat it. I am also not a breakfast person, but it is supposed to be better for us to start the day with breakfast. Aarrgh.